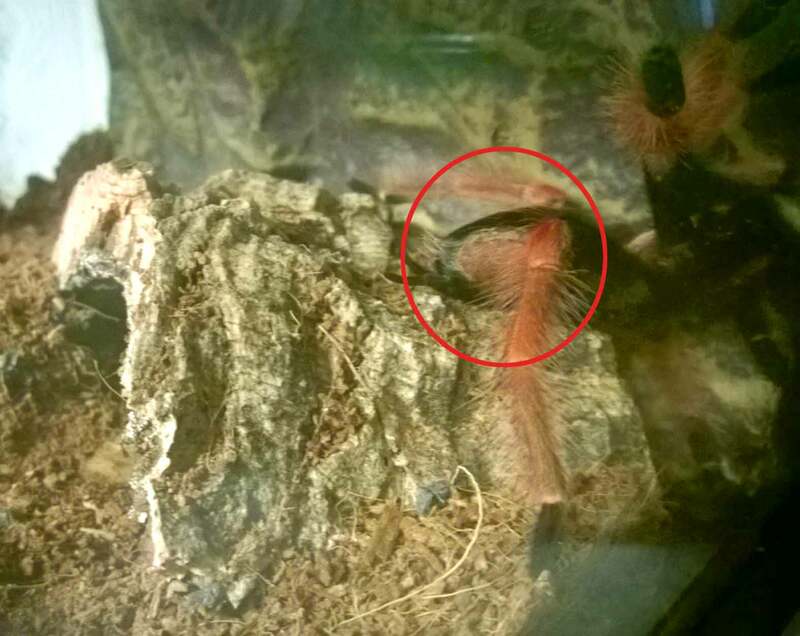 It’s been Tarantula Molt Central here, with 14 of my Ts molting in the past week (and several more in premolt). The 80º+ temps in my tarantula room have even my slowest growers sporting new skins, and it’s been amazing getting to watch several go though the long, exhausting process of molting. Since getting my Brachypelma boehmei (Mexican Fire Leg) in January of this year, I’ve been eagerly awaiting the first molt. The collector I bought it from admitted that the poor girl had taken a fall a few months before I purchased her, and although there was no visible damage, I worried that there might be something wrong internally. Still, for months, she ate like a champ, relentless chasing prey across her enclosure and quickly devouring her meals. When her pre-molt fasting began, I kept an eager eye out for the result. 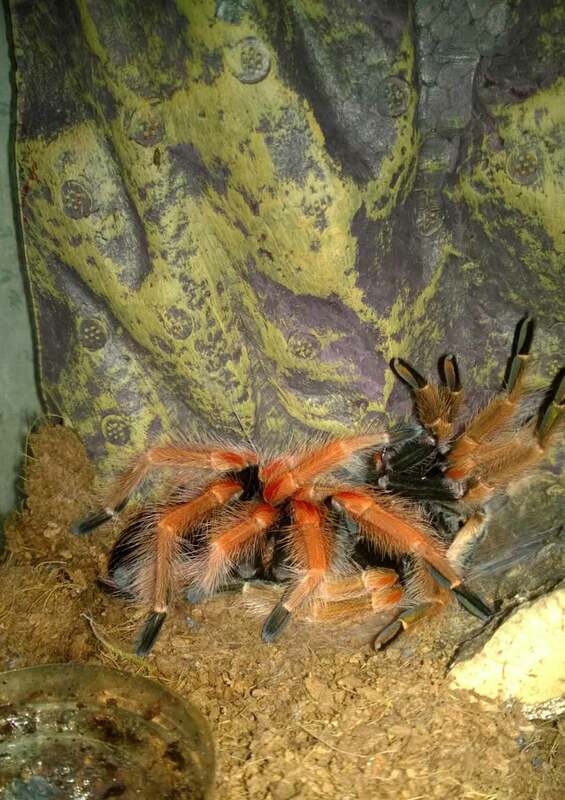 My B. boehmei on her back as she prepares for a molt. Many inexperienced keepers have thought their pets dead when they see them like this. …and a nasty-looking bald spot on her abdomen. Apparently my fears about her fall having internal consequences weren’t unfounded (although it could be a coincidence). The spot is a pale orange in color and about 6mm across. It definitely looks as if there was some damage in this area, as the edges are uneven and a bit crusty, leading to the imperfect molt. My B. boehmei sporting a new suit. I held my breath as I waited to see if she would pull through, or if this defect would prove life-threatening. So far, so good. Although the spot looks nasty, she is moving around fine and seems to be hardening up nicely. I will be careful when feeding her to be sure that she doesn’t get too distended, which could put too much pressure on this potentially weak spot in her abdomen. The bald spot on the abdomen, I’m guessing, is from an internal injury caused by a fall. Hopefully, my girl’s next molt, which I suspect wont come for several months, will go smoothly and she’ll lose this nasty patch. I plan on trying to feed her soon, and I will post how it goes. ← Peekaboo…My O. philippinus Makes a Cameo!